An American flag was spotted crumpled up in a corner during the men's wheelchair awards ceremony. By Spencer Buell·	 4/15/2019, 12:14 p.m. The Boston Athletic Association says it “apologizes sincerely” after an American flag ended up crumpled up on the ground during an awards ceremony at the 2019 Boston Marathon. 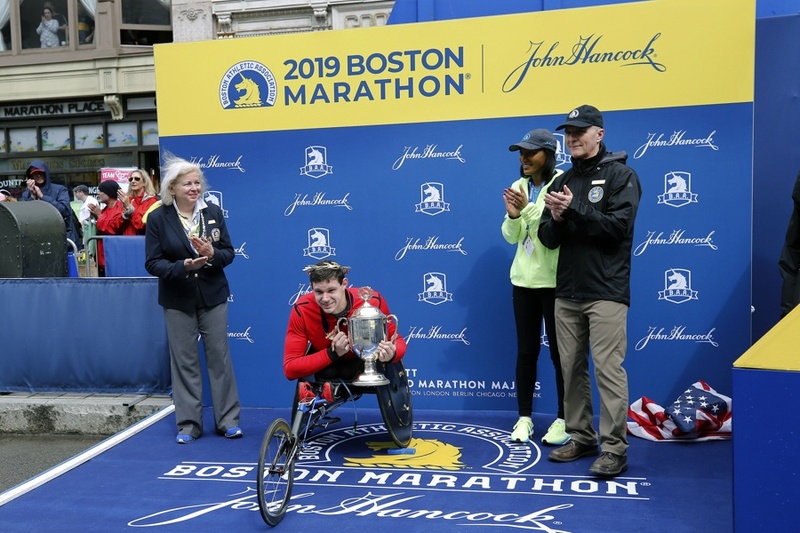 The incident came during a roadside ceremony to honor 20-year-old push rim wheelchair champion Daniel Romanchuk, the youngest ever to win in the category at the marathon and the first American to win since 1993. Video captured the moment. In front of a blue-and-white background bearing the BAA insignia, Romanchuk can be seen with his hand over his heart as the National Anthem plays and a gold crown is placed on his head and a trophy is handed to him. As the camera pulls back, the flag can be seen in a crumpled pile at the corner of the screen. Some who watched the live broadcast of the event were quick to raise concerns about the way the flag had been handled. Traditionally, an American flag is not supposed to be allowed to touch the ground. According to a description from WBZ, the official broadcaster for the event, the flag had been draped on Romanchuk’s shoulders before an unidentified race official moved it.